I have to tell you that motivation is often what holds me back as a runner. I will be the first to admit that if I take too long of a break from running, or I don't run on a regular schedule, my motivation dwindles. I do have a few tactics that always get me back on track. 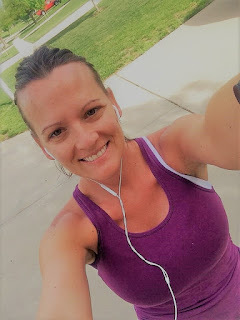 It helps me to do these three things: 1. print off a weekly running schedule and cross off my runs as I accomplish them, 2. tell others about my plans to run in order to make me more accountable, and 3. get races on the calendar so that I have tangible goals set. But do you want to know what motivates me the most? It has nothing to do with me and EVERYTHING to do with other people. My biggest motivator when I am in a running rut is to see other runners accomplish amazing things. This past weekend I spectated my first Ironman event and it was, just... amazing. Actually amazing doesn't even seem a strong enough word to explain the motivation and inspiration I gained from attending. Not only was it just breathtaking to see the strength, courage, dedication and pure athleticism these people demonstrated, but MY BROTHER was one of the athletes who finished this competition! Folks, I have to tell you. He is a testament that anyone- and I mean ANYONE can do this IF they dedicate themselves to it. It was not an easy path for him, but he has literally transformed his body, mind and soul over the last 8 months into a powerful machine. The picture above is my brother and I last year (2017) when we ran the IMT DMM full marathon together. Full disclosure, he had only ran one long-ish run to train, and that had only been 8 miles long! He had registered for the half but after a couple of hard weeks before the race he decided to change to the full marathon the night before. I was shocked, and worried, and really concerned about his lack of training. But you know what, HE DID IT! He pushed through the pain, sweat and some monster leg cramps, and HE DID IT. From that point on, he was determined to be an athlete. He saw what the human mind and body can do if it one perserveres, and he did it. Fastforward eight months and here he is (below) a 70.3 Ironman, already talking about the full 140.6 Ironman he is determined to complete in 2019. Above are pictures of my brother a few days ago at the Madison, WI Ironman, nearly 50 pounds lighter, stronger, healthier and happier than he was 8 months before. My point? YOU CAN DO THIS TOO! I am not plugging everyone completing an Ironman, because honestly, after spectating this weekend I was NOT inspired to accomplish that specific feat (I hate swimming and I have never really biked). I am, however, now motivated to get my own running training on! And guess what? You can let yourself be inspired too! Whether you want to tackle the one mile walk, your first 5K, a half or the full, YOU CAN DO THIS! You have plenty of time to train for any distance you put your mind to (but the clock is ticking so you better hit the trails soon!). The IMT DMM website has training plan options for various distances and goals, or you can always comment on this post and I can direct you to the best resource I can. So, who is with me? Let's get motivated. Let's get healthier. Let's get stronger. I'd love to learn more about what inpsires and/or motivates you. Comment below and let me know!